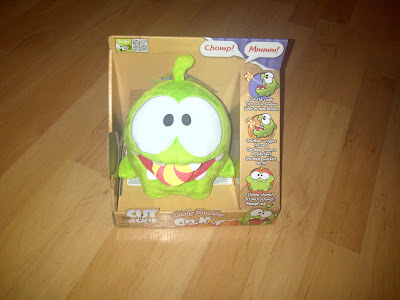 Back in July, Spud got the opportunity to review the Cut The Rope Talking Om Nom, so when Vivid got in touch with us again asking Spud would like to review the new plush Candy Monster Om Nom, Spud accepted with glee. We received the Candy Monster Om Nom and was surprised to see it was bigger than the Talking Om Nom we reviewed a few months ago. 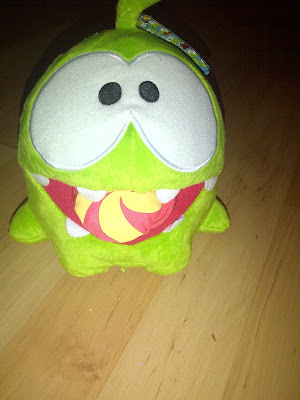 Both myself and Spud like the bigger Om Nom more, not just because of its size, but what the Candy Monster Om Nom does! Before I go on, I should mention for those of you that don't know, Cut the Rope is a downloadable puzzle game that was released in 2010, since then a sequel has been released with Cut the Rope: Experiments released in 2011 and Cut the Rope: Time Travel released this year (2013), its compatible platforms are for Android, iPhone and the iPad with plans for the Blackberry 10 underway. The original Cut the Rope game has been downloaded more than 100,000,000 (100 million) times. 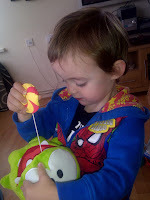 The object of the game is to cut the rope and feed Om Nom (the green monster) candy whilst collecting stars on your way. 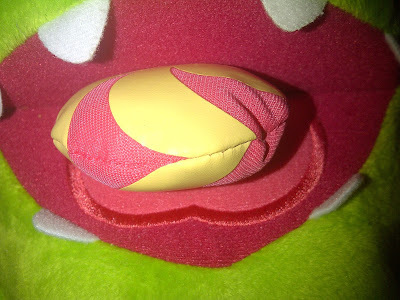 The Candy Monster Om Nom has a swirled candy sweet in his mouth, when your children pull the candy out of Candy Monster Om Nom's mouth, its attached by elastic that's like a tape measure, the rope winds back in pulling the candy piece back into Candy Monster's mouth. 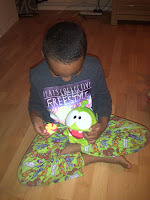 When the rope is being pulled back into the mouth by itself, Candy Monster Om Nom starts wiggling (small vibrations) giving your child a funny sensation in their hands, once the candy gets closer to Candy Om Nom's mouth, he starts making chomping and other funny noises. There are some Om Nom competitions taking place in all Entertainer stores between 29th August and 18th September where kids have to find all the Om Noms in store and then have the chance of winning goody bags! 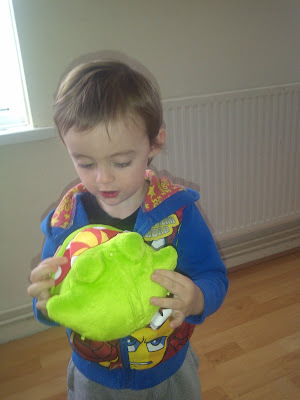 The Candy Monster Om Nom has brought many laughs and giggles to our home, not just for Spud but for his little cousin too. Suitable for ages 4+, the Candy Monster Om Nom is available to buy with a suggested RRP of £18.00 from The Entertainer and Amazon. 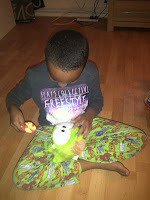 For more information or to see other Cut the Rope toys in the range, check out the official Vivid website here, you can also find them on Twitter here.